Western blot analysis of 293T cell and Hela cell lysate using SIRT7 Polyclonal Antibody. Immunofluorescence analysis of HeLa cell using SIRT7 Polyclonal Antibody. Blue: DAPI for nuclear staining. This gene encodes a member of the sirtuin family of proteins, homologs to the yeast Sir2 protein. Members of the sirtuin family are characterized by a sirtuin core domain and grouped into four classes. The functions of human sirtuins have not yet been determined; however, yeast sirtuin proteins are known to regulate epigenetic gene silencing and suppress recombination of rDNA. Studies suggest that the human sirtuins may function as intracellular regulatory proteins with mono-ADP-ribosyltransferase activity. The protein encoded by this gene is included in class IV of the sirtuin family. 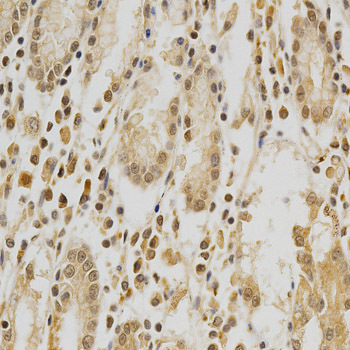 SIRT7 Polyclonal Antibody. Unconjugated. Raised in: Rabbit.